Awesome plugin to simply do exactly what it says it does. In our case we used to make manual PDFs of every post, for various reasons. When we stopped doing that in May 2016, we had a few people whine about it, even though they could have used various browser plugins, etc., to ‘burn’ their own PDF. Sadly, some folks can barely open their front door, let alone burn a PDF, and yet they demanded one to download … so this proved a perfect solution. Folks who must have a PDF and clueless on making one on their own can get one, and not bug us about it. Highly recommended. Using free version. With this plugin you can create PDF files and print pages quickly. Add PDF & print buttons to WordPress website pages, posts, and widgets. Generate documents with custom styles and useful data for archiving, sharing, or saving. Works well and offers some easy customizations like post location and whether or not you want the PDF icon. Thanks! I use this on several clients sites. Recently had a support question. I received a thoughtful and helpful answer in a timely manner that solved the problem. * Bugfix : Warnings and errors in the debug mode has been fixed. * NEW : Compatibility with Advanced Custom Fields has been added. * Update : The mPDF library has been updated to version 7.1.5. * NEW : Ability to disable content from coping has been added. * Bugfix: The bug with fonts loading has been fixed. * Update : All functionality has been updated for WordPress 4.9.5. * NEW: Ability to set custom fields for single posts has been added. * Bugfix : The bug with pdf file generation has been fixed. * NEW : Ability to select whether to open or download PDF file has been added. * NEW : Ability to select the user role PDF & Print buttons will be displayed for has been added. * Update : All functionality has been updated for WordPress 4.9.4. * NEW : An ability to set custom PDF document size has been added. * NEW : An ability to set custom featured image size has been added. * NEW : An ability to set custom watermark opacity has been added. * Update : All functionality has been updated for WordPress 4.9.1. 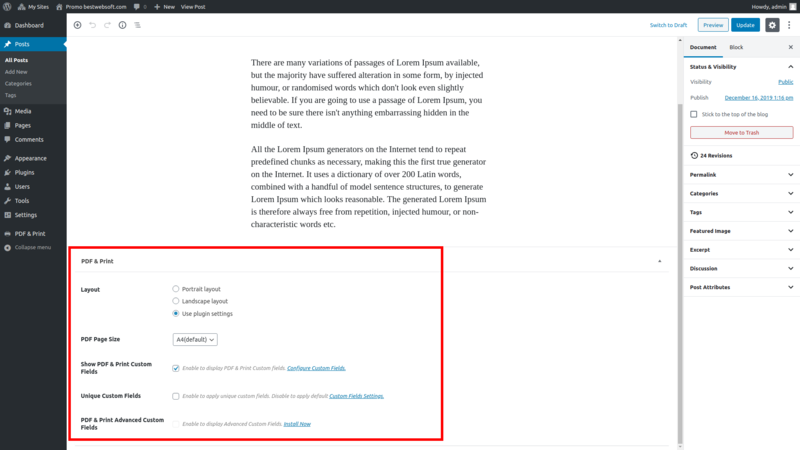 * NEW : An ability to add custom fields and custom content before and after page content has been added. * Update : WooCommerce deprecated functions have been updated. * Update : All functionality has been updated for WordPress 4.8.3. * Update : MPDF library has been updated to version 6.1.4. * Bugfix : The bug with pdf file title has been fixed. * Update : External/Affiliate product URL displaying has been added for PDF & Print WooCommerce product page. * Bugfix : The bug with displaying PDF & Print pages via the shortcode has been fixed. * Bugfix : The bug with removing Visual Composer shortcodes has been fixed. * Bugfix : The bug with displaying PDF & Print buttons on WooCommerce archive/search results page has been fixed. * Bugfix : The bug with pdf file name generation has been fixed. * Update : Dynatree has been replaced with Fancytree. * Update : `the_excerpt` filter has been added for woocommerce product excerpt. * Update : Visual Composer shortcodes have been removed for PDF&Print pages. * NEW : Widget PDF&Print Buttons has been added. * NEW : Titles were added to the buttons. * NEW : An ability to add PDF&Print buttons via shortcode has been added. * NEW : An ability to hide button images has been added. * NEW : An ability to set margins for PDF document has been added. * Update : The ability to add watermark has been added. * Update : ‘pdfprntpr_options’ option was renamed into ‘pdfprnt_options’. * Update : We updated all functionality for wordpress 4.5.3. * Bugfix : Template running titles overlay was fixed. * Bugfix : We fixed the bug with pdf and print buttons positions for archive and search pages. * Bugfix : We fixed the bug with pdf and print buttons output for custom post types. * Bugfix : Custom styles saving is updated. * NEW : The ability to set PDF layout (Portrait or Landscape) has been added. * Bugfix : We fixed the bug with instalation of the additional fonts. * New : The compatibility with Woocommerce plugin has been added. * New : The ability to add custom styles to frontend of your site site has been added. * Bugfix : The bug with displaying of PDF and Print buttons in site RSS has been fixed. * Bugfix : The bug with the function which is outputted using the_content was fixed. * New : An ability to add custom styles was added. * New : An ability to set image for buttons was added. * New : An ability to reload additional fonts was added. * New : An ability to show/hide title and featured image in the pdf/print document was added. * Update : “Bwsplgns_get_pdf_print_content”-hook`s call was changed. * Update : All functionality for wordpress 4.4-beta3 was updated. * New : Added hooks for the possibility of changing the content of the pdf/print document. * Update : We updated functionality for displaying pdf/print buttons via functions. * New : We added Top & Bottom Position of buttons in the content. * Bugfix : We fixed the bug with plugin work on multisite. * New : Added ability to select templates with running titles for pdf/print documents. * Attention : We changed plugin settings structure. If you are experiencing problems with the plugin work, please contact us via support. * Bugfix : We fixed the bug with displaying images in pdf-document. * Bugfix : We fixed the bug with creation of rtl-oriented documents. * New : Added ability to load additional fonts. * Update : We updated styles for generate pdf/print page version with default stylesheet. * Update : We updated functionality for displaying pdf/print buttons in any place of your site. * Update : We updated MPDF library to version 6.0. * NEW : We added the functionality to configure PDF & Print Pro on the Network. * Bugfix : Bug with	position of buttons in content for custom post, search or archive pages was fixed. * Bugfix : We fixed js errors. * Bugfix : Bug with showing warning in back-end was fixed. * Pro : Compatibility with Advanced Custom Fields has been added. *Update : The mPDF library has been updated to version 7.1.5. *Update : All functionality was updated for WordPress 5.0.2. *Pro : Ability to disable content from coping has been added. *Bugfix : Multiple Cross-Site Scripting (XSS) vulnerability was fixed. * Pro : Ability to set custom fields for single posts has been added. * Update : ‘pdfprntpr_options_array’ option was renamed into ‘pdfprnt_options’. * Update : Styles for correct displaying of PDF and Print buttons with theme 2016 have been added. * New : Added Top & Bottom Position of buttons in the content. * Bugfix : We fixed the bug with placing buttons on custom post pages, search pages and archives. * Update : We updated mPDF to 5.7.4 version. * Budfix : We fixed js errors. * Bugfix : Bug with Warning output in Dashboard was fixed. * Bugfix : Bug with dispalying error while searching in admin area was fixed. * New : We added posibility to turn on showing of Printer choosing window. * Bugfix : Problem with PDF and Print buttons on static homepage is fixed. * Bugfix : Problem with Chinese, Japanese and rtl languages is fixed. * NEW: Added ability to switch on/off execution of shorcodes in pdf and printing output. * NEW: Added new screenshots. * Update : Updated code, changed some styles. * Bugfix : Content on PDF preview now is shown. * Bugfix : Fixed problems with styles of choosed template in admin bar. * NEW : Added functionality for use with custom post type. * NEW : Added functionality for use with Portfolio plugin for portfolio. * NEW : Added functionality for use with Portfolio plugin for single portfolio. * NEW : Added the ability to output PDF and Print buttons on the type of page.